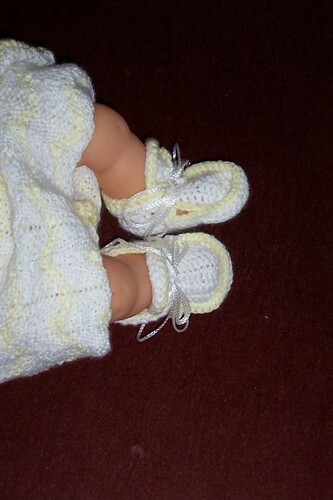 newborn-ish set « T-Bird\’s crafty Blog! 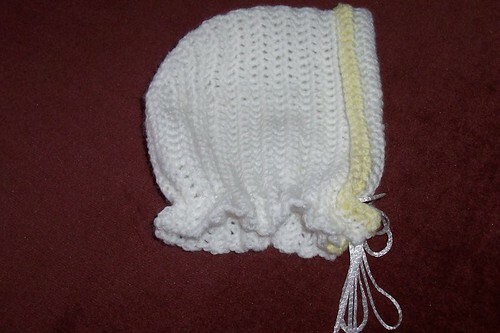 Multisized bonnet – unfold hte brim and thred the lace through forther down at the neck to make it a good inch bigger all round. Basically I wsn’t sure on the right size so erred on teh side of caution, made it big and reduced it by folding the brim and making a “ruffle” at the neck!! Easy on boottees (of course!) 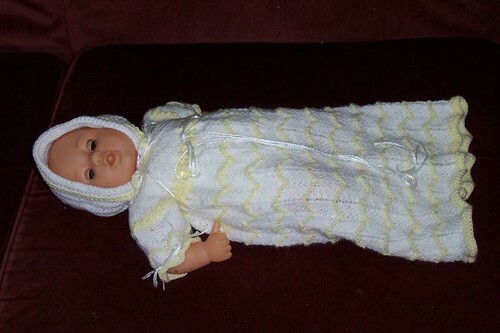 made roughly newborn sized – they are actually rather big on this doll but I suspect that is more to do with the scale of hte doll as they do seem terribly small compared to the rest of the doll. This entry was written by tbird and posted on 10 October , 2006 at 4:17 pm and filed under SCBU items. Bookmark the permalink. Follow any comments here with the RSS feed for this post. Post a comment or leave a trackback: Trackback URL. absolutely stunning. your work is beautiful and your kindness incredible in this task. you should have great pride in this blessed outfit. Your work if fantastic.Love to have the pattern myself.